CD review: "Stop and Listen"
This reissue of old 78 rpm sides from the 1930s illustrates the close relationship between African-American blues and Anglo-American country-western. The blues-based Mississippi Sheiks at times sound very close to what country star Jimmie Rodgers was playing at the time (and Rodgers himself always credited the blues with influencing much of what he did). 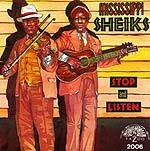 The Sheiks were a duo of violinist Lonnie Chatmon and guitarist Walter Vinson, with Vinson doubling as vocalist. Highly influential, the Sheiks' "Sitting on Top of the World" is one of the most-covered songs in the blues (with Sonny Terry and Brownie McGhee making it a minor hit in the '60s), while Howlin' Wolf, Son House and Muddy Waters cited them as early influences. Not only historic, this album is also very listenable with only a slight hiss to give away the age of the recordings (and the fact that this CD was taken from 78s, the original tape being lost to time).